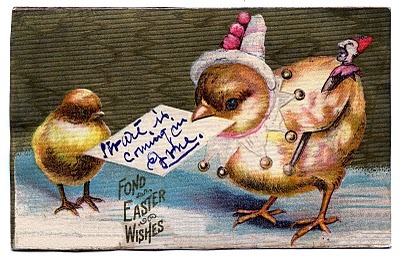 Here are three of my favorite Easter postcards! 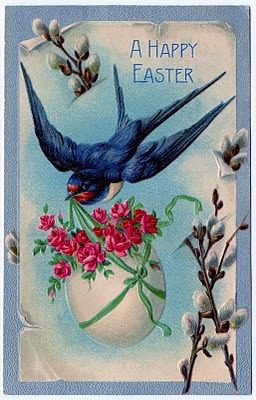 The one at the top shows a pretty Swallow bird, carrying an egg with flowers. I think this one is my favorite. The funny chick dressed in a Pierrot costume, just cracks me up! And lastly… nothing says cute like a baby duck dressed in a gingham romper! 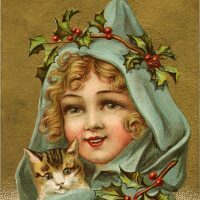 Old Cute Girl and Cat Christmas Image! 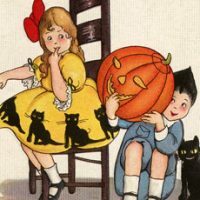 Free Clip Art – Vintage Valentine Vintage Halloween Greeting with Children Post Card! Love the baby duck in blue gingham. The shoes and sagging socks are so sweet they make my teeth hurt. I like the baby duck best! He’s so dapper in his outfit. I printed a couple of the Blue Swallows on Cardstock…they are gorgeous! Once again, Thank you! I have a comment/question for you. 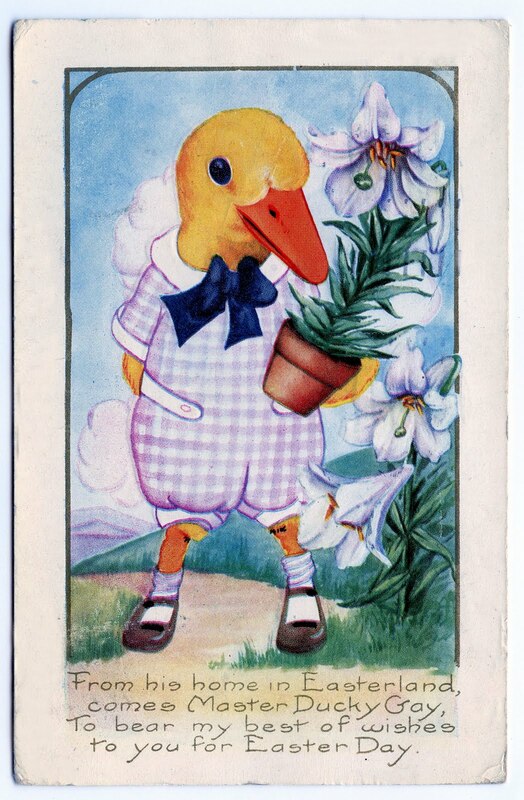 I have been collecting Vintage and Antique postcards for quite some time. I buy them because I love the images, But,,,sometimes, on the postcards it is the messages and/or addresses on the backside that intrigue me the most! Too fun! You just never know what you are going to find on the back of the old cards! I’ll close with,,,,,Happy Weekend, Karen! I have the crud! I have never known where you get all your wonderful images,,,but just wanted to share with you my finds/ thoughts! Hugs,,,,,,and good thing they are cyber,,because this buy is NOT fun! I so love the bluebird image. I am going to use it as a tag for my mothers Easter gift. Thank you for sharing it. My first love has to be little duck. Bless his heart..he’s so well dressed in sweet blue gingham,but oh my!! his little socks. This is one of the sweetest pictures ever..thank you so much for sharing them with us Karen. Thanks for the lovely card images today, Karen! Have a great day. The funniest thing is that duck’s name: Master Ducky Gay. Ha! I cannot choose! They are all wonderful! Thank you! Your favourite is mine as well. Does it get any cuter than that? These are all lovely. Thank you! I Love the duck!! Very cute and sweet! I want to share with you my new blog for kids and their parents! Come and visit and have lots of fun! I LOVE all three images… but the baby duck dressed in a romper just made me laugh! I can’t wait to use him at my next scrap day with girlfriends- he’s sure to bring a smile. It looks like “Master Ducky Gay” is in the lead for most popular! I’m in love with the baby chick. 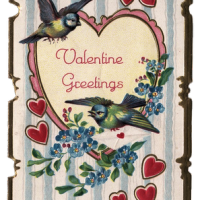 Thanks so much for sharing this sweet little card. Very pretty cards! Thanks so much for sharing! I’m kind of just getting into finding these old vintage cards and love them! It’s alot of fun. My mom and I pick them up if we see some while we are out! 🙂 Have a good weekend!